1 How to braid classic spike? 2 How to braid original spike? Spike is called a French plait. In fact, not every woman knows all such embodiments weaving braids. A lot of them. How to braid spike in all its versions and will be discussed in this article. How to braid classic spike? To spike turned right and beautiful, it is necessary to draw attention to yourself hair. Ideally, they should be obedient, strong and healthy. If a, conversely, it is necessary before, begin to weave, use what - or tonics, eg, mousse or balm. This will help to achieve the desired result. To further itself quickly to braid French braid, you can first practice on girlfriend. We arm comb, to how to comb hair. Then decide for themselves, in what way we would like to braid spike. There are only three. The first netting, starting directly from the hair growth, the second is to retreat a few inches, and the third way - to release the locks on the sides. Leave a fringe or not, it is optional. With the help of a comb grab most of the hair in the middle, which divide into three equal strips. 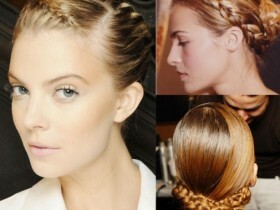 Then crisscross them, each time adding additional thin strand of hair left on the sides. And always with a good stretch the netting every hair. Then the hair will not fall apart, and it will look perfect. Weave until, until the entire length of hair will be used. At the end secure eraser, barrette, anything, you can just comb. How to braid original spike? Klassycheskyy ear, of course, looks beautiful, but, if constantly braid equally, get bored. Based on it can be modeled hairstyles, animate image. After all, in fact,, There are several types of the original spikelet. You can braid zigzag, around the head and yet all different. Such variant looks very beautiful, It creates a business image. Braid a spike is not difficult. Spit begins on the right temple, and ends at the left. Add strands can be both inside and outside at the same time, or just use some external. During weaving it is necessary to maintain the shape of a semicircle. The remaining length of the spit to fix over the head. It turns out such an original bezel. Another easy way to stand out. Updo two ears on the sides. It is very easy given, if you know how to weave the usual classic version. Just one big strand do two, and the two divide into three parts, each. We begin to weave braid, first right, then left. At the end of the braid can be left or tails, if they got fat, these come from housewives thick hair, you can continue braiding to the end. How zaplesti zigzagom? The principle is weaving: We start walking on the right ear, adding locks to the right side, after a distance change direction braids and weave an additional strand to the left side. And so on, do not forget to change the weave direction at regular intervals. There are a couple of options, how zaplesti kolosok, but it is better to do in the salons.